Let's get one thing straight right now: this is not a chocolate cake. I know. It says it is in the title. 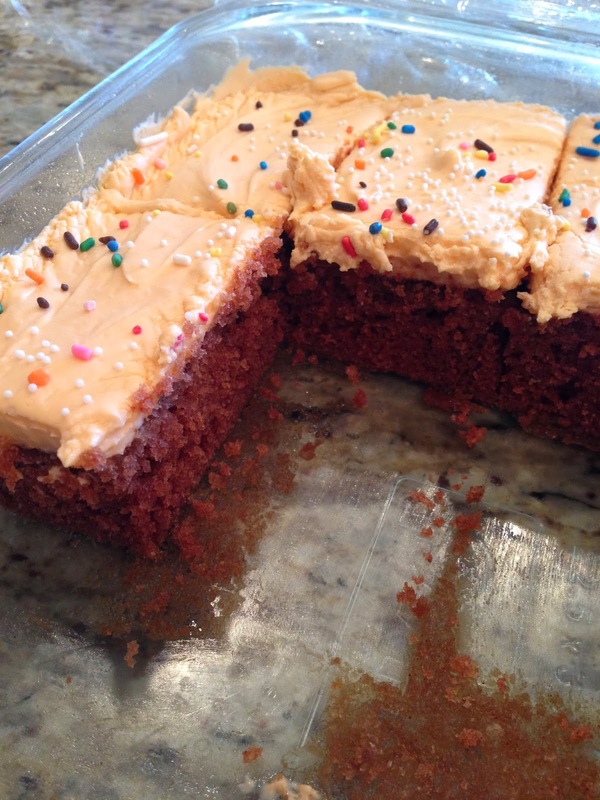 It even has a brownish tinge to it like a chocolate cake would (see below). But it's not. And it CERTAINLY doesn't deserve the word "fudge" anywhere near it. Now, DON'T GET ME WRONG. This is a good cake. Delicious. In fact, there were a couple of people (namely, Seconda, who wants this as her birthday cake) who thought it was one of the best cakes they've ever had. 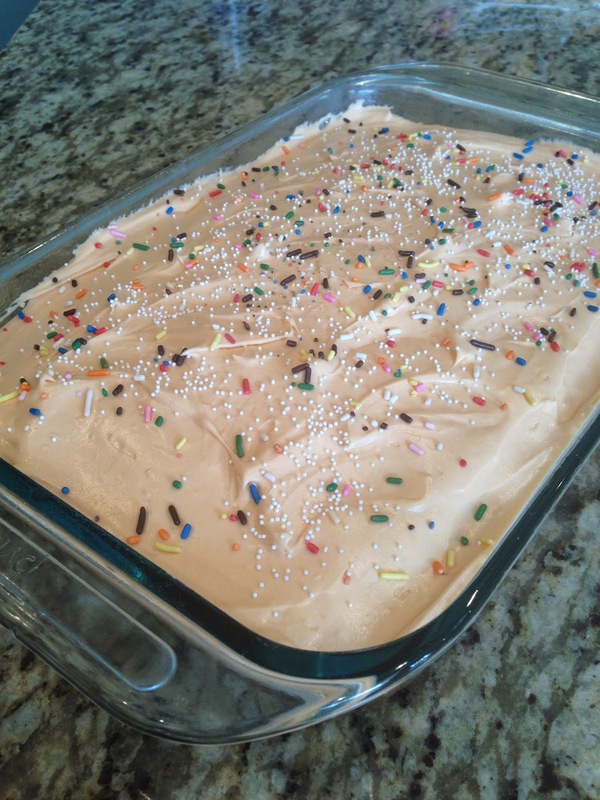 It's tender and moist and the frosting is really tart and sweet and creamy and cream-cheesy and lovely. AND it does deserve the "lazy" part of the title. No, it's not exactly a one-bowl cake, but it's so easy to mix up batter and not fuss with layers, just pour it all into one pan and slather that thing with a thick layer of frosting. Exactly what I wanted. BUT I wanted CHOCOLATE. Hence, my cake itch is still not scratched. I'm starting to worry that it may never be. I know you have a family recipe out there (that doesn't come from a box) for a good, old-fashioned, chocolate lazy Sunday cake. Send it to me. Like, now. TGIP Rating--Lazy Cake--KEEPER. Like I said, Seconda wants it for her birthday. And it's really a lovely cake. It just won't scratch your chocolate itch. Next up: A while back I tried to do a riff on the Baltimore Bomb Pie, I called it a Salt Lake Bomb Pie. I think it needs improvement. Namely, it needs to contain the thing that my favorite Salt Lake bakery is really famous for: Kouing Aman. If you live in Salt Lake (or nearby) and you haven't been to this bakery or tried this pastry...mend your ways. I rarely make savory pies and every time I do make one I wonder why I don't do it more often. I guess there's a lot of chopping involved. 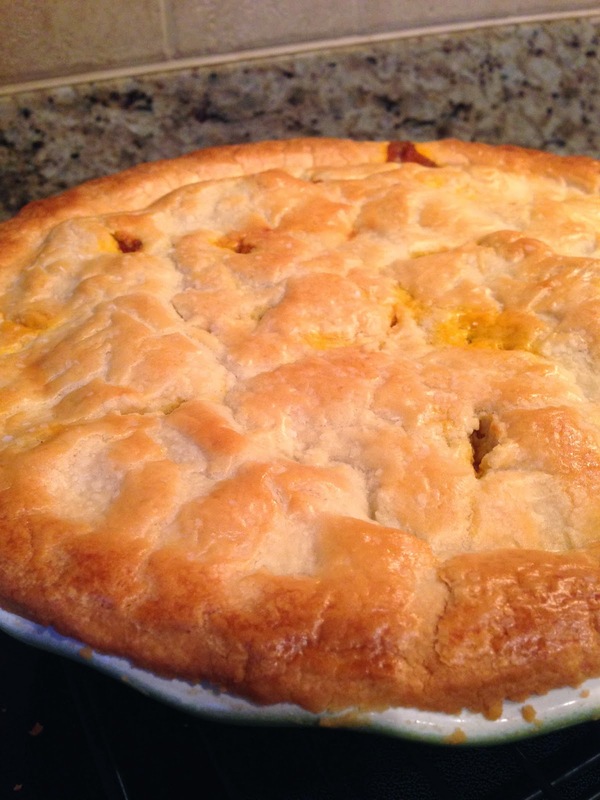 And usually you have to get the sauce to just the right level of thickness so the pie isn't runny when you cut into it. And that's intimidating. But, honestly, I make some pretty complicated desserts, so I need to just get over my savory pie aversion. Especially because they always end up YUMMY. This was no exception. I was initially concerned about the coconut part of the recipe because mr. is not much of a fan. But it is really subtle and just lends a richness to the flavor without making it heavy like cream would. The sauce is spiced nicely and has just the right amount of thickness. The vegetables are perfectly cooked, not underdone but not mushy. All around, completely delicious. Go here for the recipe. I used my own crust recipe, but used a different method of making it. A method named Food Processor. That was a mistake. When you have a method that works, don't mess with it. The crust still tasted fine, of course, but was impossible to deal with, both cooked and uncooked (you can see my shoddy patching job above). It was just SO fragile. And when it was cooked, it looked okay, the patching job isn't very evident (see below), but it SHATTERED when I cut into it. So, even with a good thickness to the sauce, due to my own error in judgment the pie was virtually impossible to serve in any sort of pie-like shape. Everybody essentially got a pile of filling and crust on their plate. Not pretty. 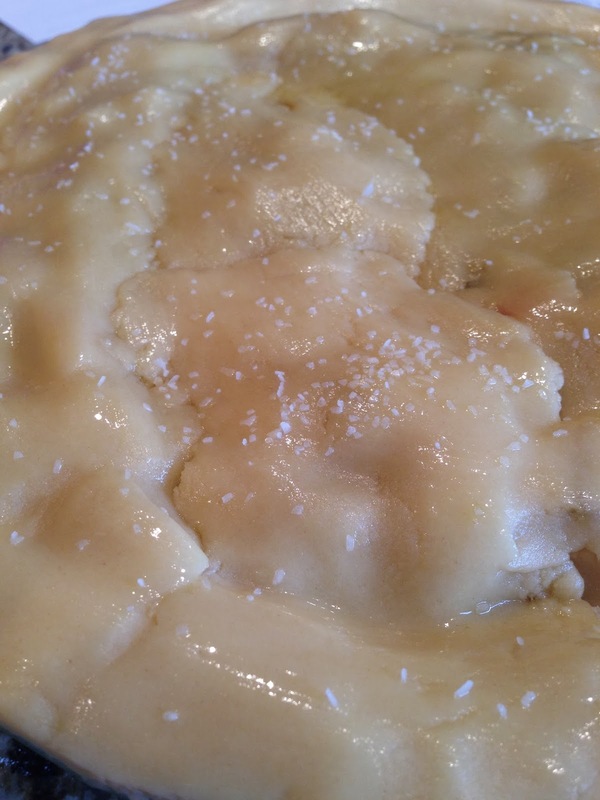 TGIP Rating--Coconut Curry Chicken Pot Pie--KEEPER. I'll definitely try this again, and do the crust the right way. I have no doubt that it will be delightful. Next up: Lazy Cake AKA Aunt Naomi's Chocolate Fudge Cake. I've still got that cake itch that needs to be scratched. But I need a lazy Sunday project. 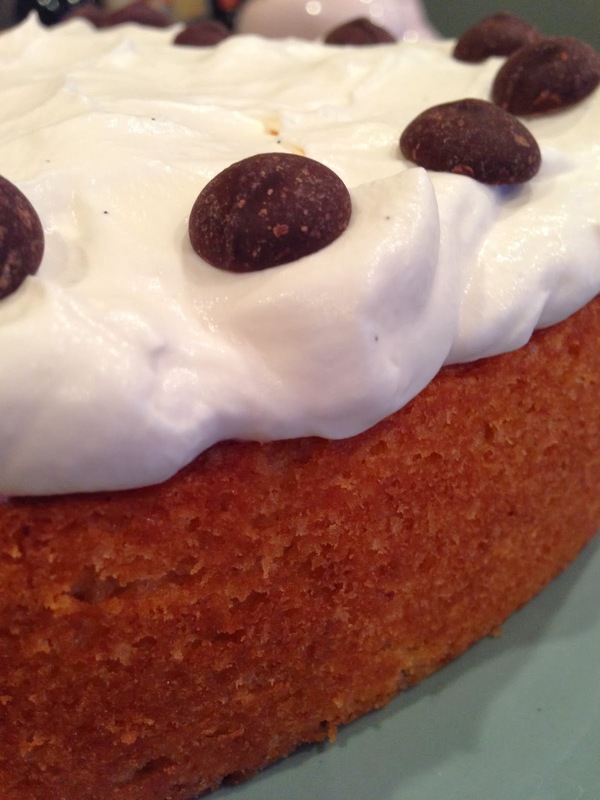 TGIP Rating--Brown Butter Cake with Vanilla Bean Cream--MEH. Won't make this one again. Far too many other good cakes out there. Next up: A savory pie, for a change. 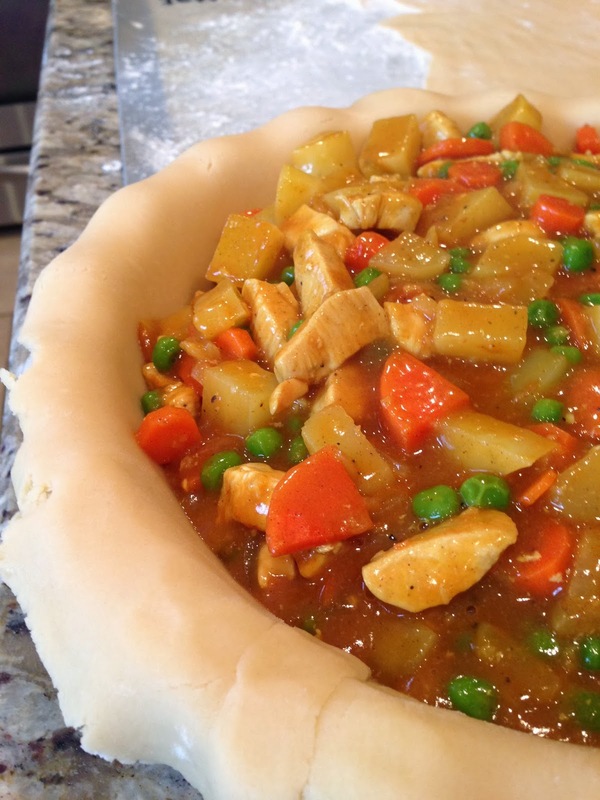 Coconut Curry Chicken Pot Pie, to be exact.